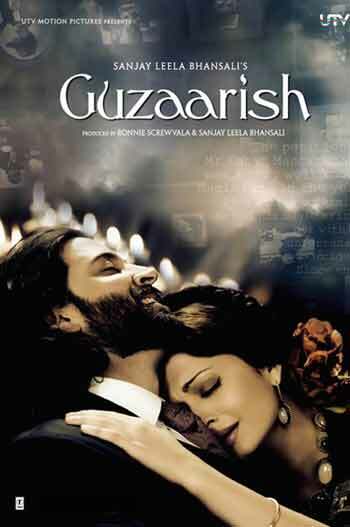 Even though "Guzaarish" is Sanjay Leela Bhansali's debut foray into music direction, the filmmaker-turned-composer has done an astounding job, aptly capturing the mood and feel of the film that stars Hrithik Roshan as a paraplegic and Aishwarya Rai as his nurse. The soundtrack boasts of 10 original tracks and no remixes. The album begins with the title track, which is also one of the best tracks of the film. Sung by KK in his soulful voice and with ample support from Shail Hada, the love ballad is beautifully composed. A soft approach and predominance of the accordion gives the song an edge. Next is an interestingly written song, "Sau gram zindagi", with Kunal Ganjawala behind the mike. Even though the track has unconventional lyrics, it still stands tall owing to Ganjawala's brilliant vocals and the melody of the composition. A track that is based on life, "Sau gram zindagi" has a very nice thought behind it. The only damper is the English lyrics that emerge at the end. They seem quite unnecessary in the audio but might add more sense visually. "Tera zikr", another love song in appreciation of one's lady love, is crooned by Shail Hada and Rakesh Pandit. The slow moving number is worth a listen but somehow doesn't generate the urge to hear it again. Then the album takes a slight turn with the emergence of "Saiba" by Vibhavari Joshi. After three slow numbers "Saiba" gets some pace to the soundtrack. The song has a very international feel and seems more of a situational track. Next in line is KK singing "Jaane kiska khwab" in his impressive voice. The lyrics are the main plus point of this track in which vocals are given more importance than instruments. The orchestration has been kept minimal that brings about a tranquilizing effect in the song. Then another moderately paced song comes in the guise of "Udi" sung by Sunidhi Chauhan and Shail Hada. The track has the feel of a carnival. This one is just passable in the context of the album. "Keh na saku" is another brilliant track of the album. This one comes very close to the title track in terms of appeal. The romantic number crooned by Shail Hada again makes you fall in love with the track, which is slow-paced. It strikes a chord with the listener with its musical arrangement and soul-stirring composition. A clear winner. Up next the album throws open a young, impressive, budding voice of Harshdeep Kaur, who has given the vocals for "Chaand ki katori". The soft, pleasing and soulful song appeals mainly because of the astounding voice of the singer, which fits the track completely. Subdued musical arrangements are a plus because they lend focus to the vocals. There are moments in the song that are clearly its highlights. Listen in loop to thoroughly enjoy every element of this track. Then there is "Daayein baayein" sung by KK. A free-flowing love song, "Daayein baayein" follows the principle of slow moving tracks adopted in this album but somehow doesn't create a strong impression. It is neither bad nor brilliant. Finally we have "Dhundhli dhundhli" that has Shankar Mahadevan behind the mike. The song begins with the chirping of birds, it sets a pensive mood and has violin as the predominant instrument. The parts where Mahadevan takes the high pitch are very interesting and give an edge to the track. On the whole, as a first time music director, Bhansali has done a commendable job, concentrating more on vocals and quality of compositions than just the beats. The album will surely be appreciated by music buffs.